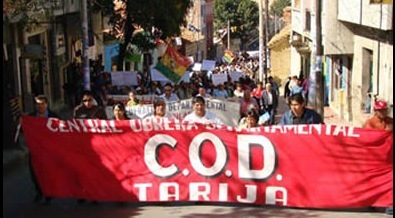 Tarija workers’ union rejects intend of current president to seek re-re-election! It is inconceivable that current Bolivian president seeks to continue in government. He and his acolytes have played with the constitution, erased the Republic and began a “pluri-national State”. Typical behavior of those who believe they own our country… well, the workers of Tarija are among the first to deny that atrocity! Ramallo said that the working class of the country is disappointed by the scaffolding of the Morales Government, because despite having managed more than $50 billion dollars in the past seven years, product of the nationalization of hydrocarbons, there continues to have extreme poverty in the country, the high rate of unemployment, poor health service; lack of access to basic services in rural areas and low wages. “You have to respect the Constitution, as we respect our Constitution, if the President has been elected two consecutive efforts as the political Constitution of the State (CPE), says he has to take a step to the side, I think that he doesn’t have to be so ambitious to want to continue in the Government,” said the Union leader, who lamented the egotistical policy that manages the State apparatus. According to the representative of the COD, it has been for long time that the working-class ceased to trust in the management of the MAS and President Morales, because they would have not responded to the demands of the labor sector in the country, did not reduce levels of corruption in public administration and despite its policies, smuggling continues in the large popular malls in the nine departments of the country. The President said that the inquiry which made the Senate to the Constitutional Court about his re-election is not necessary and “it is not needed”.